What a comeback! What an upset! 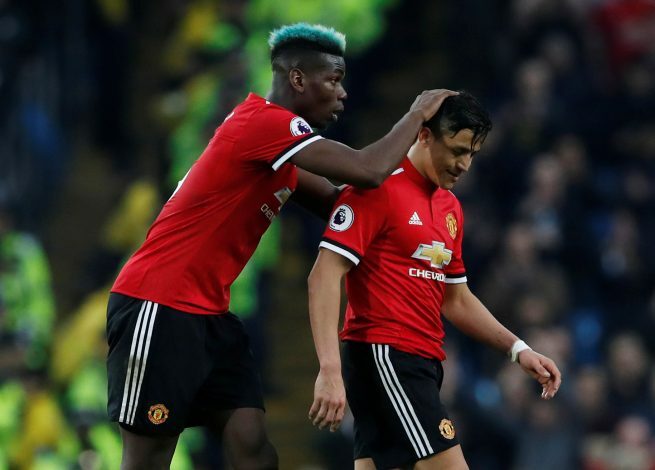 Manchester United succeeded in spoiling the party for their noisy neighbors, as the Red Devils managed to bring back a two-goal deficit to ensure that the Etihad won’t be celebrating Premier League glory just yet. Second half beauties from Paul Pogba and Chris Smalling, the former providing a splendid brace, were enough to cancel the early and spirited efforts from Kompany and Gundogan. More importantly, United became the first team to defeat City at their home ground this season, breaking a streak that was nearly 490 days in the making. Apt revenge for the manner in which City demolished United’s own home record earlier in the season. Horrible showing from the Spaniard initially when he seemed powerless against letting in the first half goals, the second of which was a direct result of his folly. However, held his own quite well later on and didn’t crack under late pressure. The captain for the game did a brilliant job in securing United’s flank, and was energetic even in the face of two goals going in. United’s best defender for the game and if not for the error of being responsible for Kompany’s goal via poor marking, had a great showing at the heart of things. His winner is bound to go down sour among the City fans, while the Red Devils will be grateful that his simple effort went into the back of the net. Could have done much more in the opening half to secure the defense. Provided a steady and reliable wall in the dying moments of the match, ensuring City couldn’t get through even the few chances they had. While maintaining a good defensive ethos, he simply wasn’t at the top of his game on the night. However, flank duty was done great justice, and he was steady in taking the Red Devils forward. The silent architect of United’s return. Was a consistent threat even when his side seemed far from threatening, and did a brilliant job at assisting Pogba’s opener, which was more by virtue of his play. Steady and a reliable conduit. With a pass success percentage of 87, he proved that he can be threatening even against a City team that barely let United a whiff of the ball in the first-half. Looked to be the weak link in United’s attack and openly frustrated Lukaku by his intentional attempts rather than letting the ball forward with ease. Regardless, a vital cog in the victory. Man of the match, no questions asked. A great return to grace for the Frenchman who secured the headline in a matter of just two minutes. Translated Herrera’s and Sanchez’s efforts perfectly and left a mark on the Etihad that will sting till they eventually lift the cup. Issues solved? While seeming increasingly unsteady at the beginning, the Chilean was in the mood from the start of the second half itself. With two assists to his name, the second being the winner, it is clear where his technical skills far surpass what he lacks in scoring goals. Poor from the Belgian, from whom a lot more was expected. While an initially well-formed City defense and a relatively selfish Lingard can be the source of his toothlessness, yet again, the utter lack of attempts at goal is not becoming of United’s top scorer. All of United’s substitutions were time-wasting tactics on part of Mourinho and didn’t have much bearing on a match that was well decided by the time the winner was scored, prior to which Rashford was being prepped as a potential impact substitution by Mourinho. Dreadful from the keeper, particularly when it came to letting in Smalling’s winner. A lot more could have been done to ensure City secured the title well during the game. While a constant attacking threat and a creative conduit, his efforts seemed relegated to timed runs rather than an actual presence of creative danger against a strong United in the second-half. The Belgian will be utterly gutted that his well-headed goal didn’t secure the title for City like it had in the past. Regardless, he was also the home side’s best defender for the game, but his individual efforts weren’t enough to counteract United when they got going. Surprisingly the worst defender on the field. Had a terrible reaction to both of Pogba’s goals and was very inept at pairing with Kompany, being guilty of losing most of his duels. Was better at flanking than Danilo was, but was nevertheless a destitute presence in the defense going into the dying moments of the second half. By the time he did what was expected of him, United had the game well in the bag. A constant presence in the first-half and a dangerous attacker, it is a pity he got just one goal at the end of the day. All of his 5 shots were worthy of goals, and his 94% pass success rate was unprecedented for the day. Guardiola’s secret weapon wasn’t very effective against their bitter rivals. Perhaps a tad bit too predictable going into the second half, he ceased being a danger once Matic and the United defense got their conduit set-up going well. More could have been done from a player that has been one of City’s finest. While him starting over De Bruyne had to do largely with the upcoming Liverpool game, perhaps the change could have made all the difference in a game that for once had City feeling underwhelmed in terms of offensive abilities. Looked unsure in the attack, he wasn’t able to match up to what Sterling and Sane were succeeding at quite well elsewhere. His sole shot, however, could have caused great worries for United had it gone in. City’s finest player for the night, and was a source of constant and persuasive power in the first-half wherein his assist to Gundogan really got things going. Pity he wasn’t able to keep it up and that Pogba’s goals caught them by surprise. Marked to be a major headache for United going into the game, he failed to live up to the expectations, and ended up making quite a few blunders as well. His 5 crosses were a splendid chance after chance for City and his opening corner was near perfect. Ought to have been given the start, the Belgian wasn’t able to have all too big of an impact, although he was able to scamper in a lone shot, that too off target. Was able to get in two shots that were blocked quite well and provided a much better flow to the game at a stage when United were upping the ante remarkably. Was City’s best substitution for the night, and fans will be relieved to have him playing again. While he was unable to replicate his immortal magic against QPR this time around, he might end up scoring the goal that gives City their third title.